It is hard to believe that this is a work of fiction. It is so realistically written that it feels like a real adventure. I enjoy stories based on the Middle East and therefore this story is a good reading treat. The story dwells heavily with the military operation and how the supply of arms to foreign country is made difficult under the control of the USA. I like how the author described places like Afghanistan and Kuala Lumpur in detail that literally makes me feel like being transported to those places. Some parts of the book will require you to pay close attention to different timelines as the story jumps back and forth to different dates. A great read and a well thought-out book! Rick Fontain is back… A Cold War adventure that peers inside the exploits of Senator Charlie Wilson and CIA’s Task Force Chief Gust Avrakotos. Strange bedfellows they were… their alliance proved to be one of the most successful partnerships in the history of the CIA. 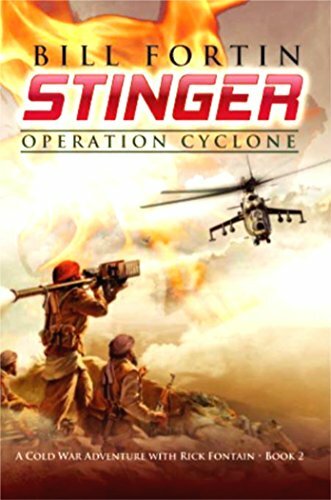 Stinger: Operation Cyclone centers on the results of these efforts. General Gerald Bushman returns as the Director, Defense Intelligence Agency. Rick Fontain, who was now a Member, Technical Staff of AT&T’s Bell Labs, is brought in for his expertise with the Stinger technology. His familiarity with the Russian gunship, the Mil Mi24 was just icing on the cake. In 1985 President Zia finally OK’s the American plan to provide the Stinger technology to the Mujahideen. American Special Forces, the Green Beret and DELTA, were assigned to the training center at the ISI’s Ojhri Camp. CIA’s, LTC Jim Pezlola and CWO Gary Larson, solicit the Mujahideen Command to provide students for the very first class of Stinger shooters. I’m so glad you enjoyed ‘Stinger’!